I think I've mentioned it before, but I was a vegetarian for 8 years growing up. I was 7 when I gave up meat, and I started eating chicken and fish again when I was 15. Even though I was vegetarian, I didn't eat "vegetarian" foods all that much. I was perfectly happy to subsist off of macaroni and cheese, french fries, and peanut butter and jelly sandwiches. I was not a fan of tofu or other meat replacement type foods. Ironically enough, now that I do eat meat, I actually really enjoy those foods. Recently, I have been making an effort to go meatless for a few dinners per week, and I've been enjoying finding new foods and cuisines that we like. I had been wanting to make falafel for quite some time, but I was put off by frying them. Both for health reasons and well, the mess it makes. I saw Cate make baked falafel recently, and I was excited to try it. Y'all, this is seriously one of the easiest, low mainentance meals ever. You do have to plan for it, since the garbanzo beans need to soak overnight, but after that it comes together quite quickly. I made mine a little bigger, and we ate them as patties, versus wrapping them in pita. I think they are delicious either way, and I'll definitely keep this in my rotation as a vegetarian night dinner. Place the beans in a medium bowl and cover with a few inches of water. Allow to soak 24 hours. Preheat the oven to 350. Pour 2-4 tablespoons olive oil onto a baking sheet, and tilt to cover the entire sheet. Drain and rinse the chickpeas, and transfer them to a food processor fitted with the steel blade. Add the onion, parsley, salt, garlic, cayenne, cumin, coriander, and lemon, and pulse several times, until a paste forms. Transfer to a medium bowl, add the baking powder, and mix to combine. Add the flour, one tablespoon at a time, until the mixture stays together when formed into a ball. Working 2-3 Tablespoons at a time, form the mixture into balls, then flatten into 3/4 inch thick patties. Line on the baking sheet, and bake 20 minutes, flipping halfway through, until the outsides are browned and crispy. I agree that even if you're not eating a strictly vegetarian diet it's fun to try new foods and go meatless once in awhile. We are not vegetarians either yet there are so many meatless meals that we crave and are perfectly satisfying - baked falafel definitely being one of them! It looks like you do not cook the chickpeas, just soak them. Is this true? I have a baked falafel recipe that I've been making for years, but this one looks really good. I've bookmarked to try soon. I wonder if you could use canned chickpeas, since those are already hydrated. . ..
Jennifer, That's right. 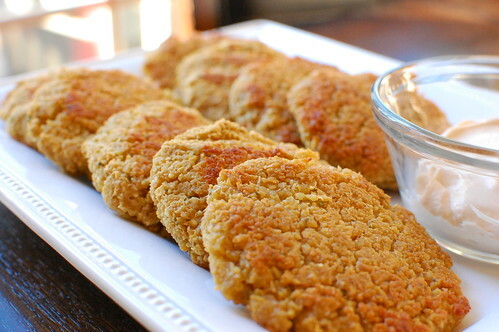 The chickpeas are soaked, and then after they are formed into patties they cook in the oven. I'm not sure. My biggest concern would be turning the mixture into hummus in the food processor. Even though the chickpeas are soaked, they aren't cooked, so they retain a somewhat chunky texture until they are baked. Maybe if you just pulsed them a few times they would still be okay... if you try it, let me know! I can't wait to try these! I've been making Real Simple's chickpea patty recipe for awhile now, but they never hold together well for me. Those use canned chickpeas that are mixed in the food processor, and they stay pretty chunky. These look like they hold together much better. I just came across your blog on foodgawker, I plan on making your strawberry shortcake cookies really soon! But I just wanted to day, that's exactly how I was vegetarian, I hated tofu and basically subsisted off of carbs. My entire family only eats fish so that's how I grew up. I stopped being vegetarian when I was 17 but still don't eat much meat. These falafal look delicious! This was the second time we've made these and they are amazing! I love how easy they are and the whole family eats them up. I just made this for dinner tonight after having it bookmarked forever. David & I both LOVED it! I used canned chickpeas, and it still worked just fine. This is really informative post.I will aware about this information to others friends.Actually I would like to know more about this stuff.